Is cork flooring right for you? At Décor Floors located in Toronto, Mississauga and Brampton, our experts can help you decide on the perfect, high quality flooring for your home or office space. Cork offers many benefits and could be just what you are looking for! Cork comes from the bark of the cork oak tree (Quercus suber) which grows primarily along the coast of the Mediterranean Sea. Spain, Portugal, France, Italy, Algeria and Tunisia all produce cork. All trees have bark (cork), but the cork oak tree is known for its thick layer. Why such a thick layer? The bark protects these trees from the harsh conditions such as droughts, fluctuating temperatures and even fire that they are exposed to in the environment where they grow. The cork of the cork oak tree is also naturally resistant to rot, termites, and fire. It is very light weight, buoyant, and impermeable to moisture and gas. This explains why cork is such a great product for wine bottles…and floors! With proper care, cork floors can last for a long-time – up to 40 years! They are impermeable to moisture and gas and resistant to cracking and scratches. Most indentations from furniture etc. bounce back, due to corks resilient properties! Cork is an insulator, so it helps to reduce noise and also can be warmer in the winter and cooler in the summer compared to ceramic tile and hardwood floors. Gives the feeling of warmth to any room. Very comfortable to walk as it compresses giving a cushioning effect. when a cork oak tree is 25 years old the bark can be harvested. The bark grows back and between 8 and 14 years later, it can be harvested again. This can continue for as long as the tree lives, which can be up to 800 years although 150 to 200 years is more common! 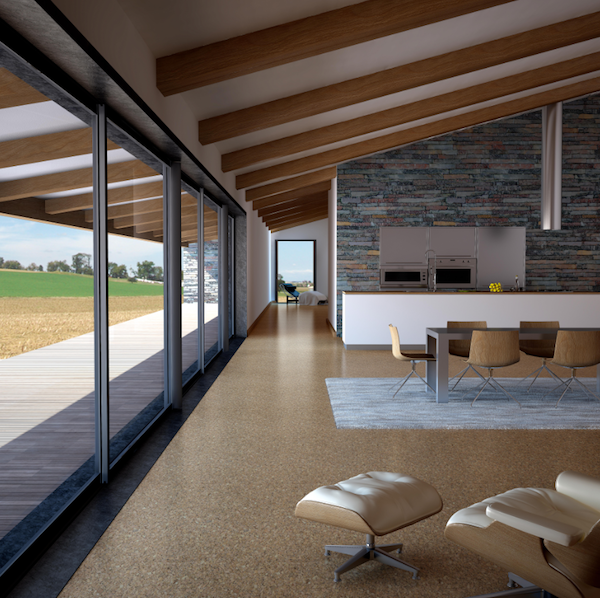 There is practically no waste during the manufacturing process of cork floors. The cork is ground up and then held together with binders. Because cork is naturally resistant to mold, mildew, termites, and fire cork flooring is a safe and healthy flooring choice! No volatile gases are given off by cork, keeping the indoor air quality of your home safe as well! Cork flooring is available in a variety of sizes and colours as planks or tiles. Planks can provide a seamless appearance, or tiles can be used (even in different colours) to create unique and interesting patterns. For more information visit our FAQ’s on cork flooring or drop by any of our 3 locations and talk to one of our experts!